The Commodore PET was produced by CBM way back when we were all being amazed by a new film at the cinema called 'Star Wars'. 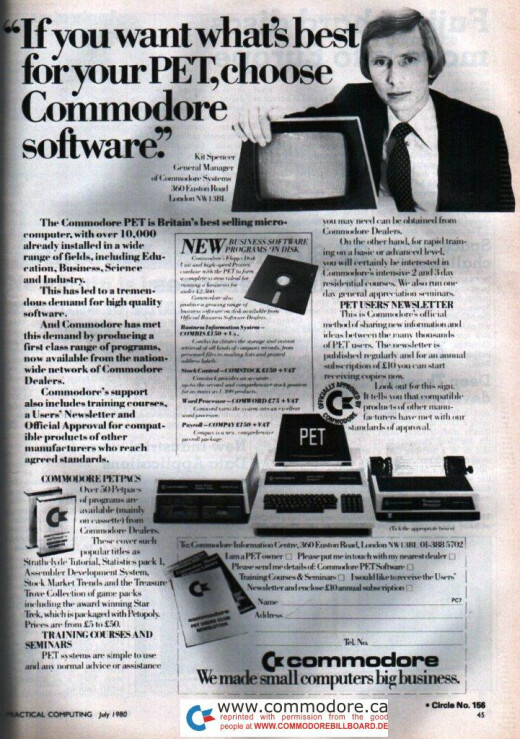 The year was 1977 and the 'Personal Electronic Transactor' was Commodore's first full featured computer that set the foundations of their future success. CBM (as they were then known) had arrived. 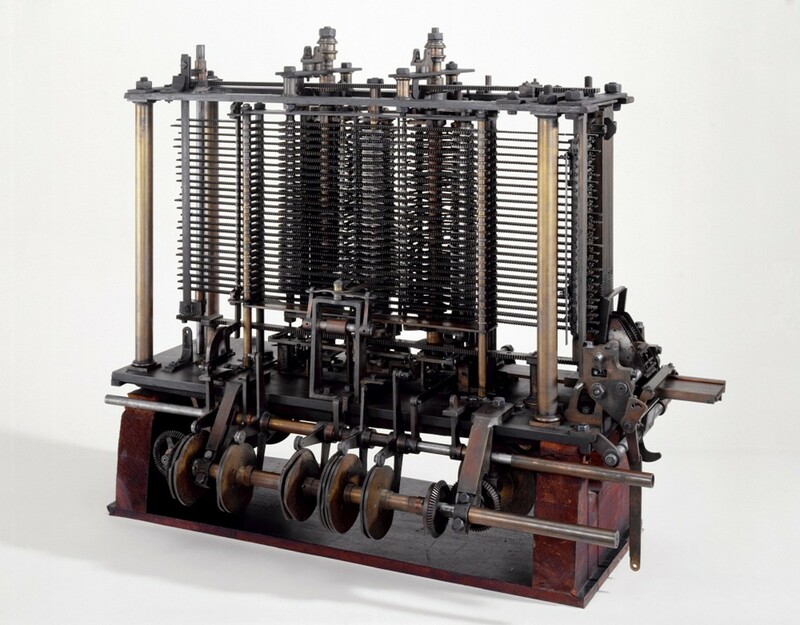 The machine found a niche for itself in the Canadian and US markets, and was also put to good use within the UK educational sector. 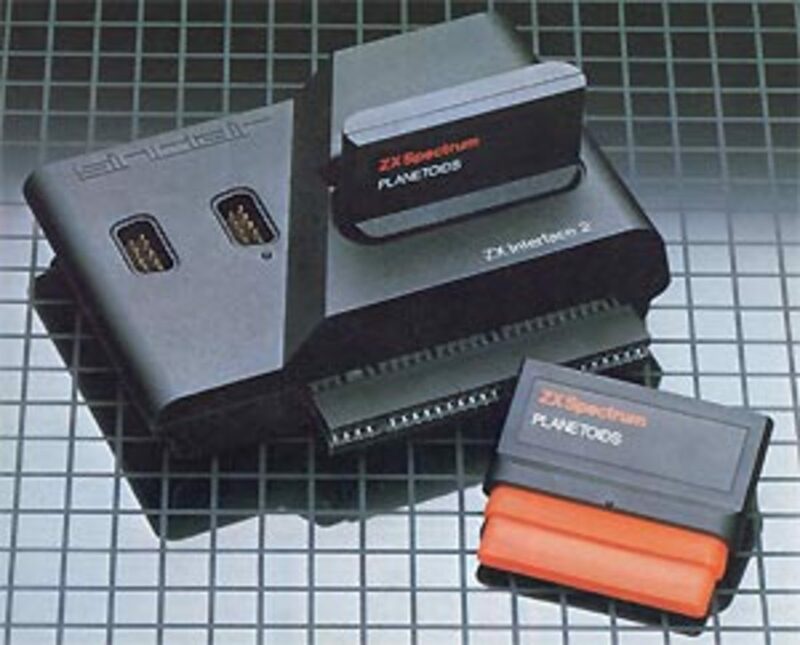 The first model was the futuristc sounding PET 2001, including either 4KB (the 2001-4 model) or 8KB (2001-8 model) of 8-Bit RAM. Yes - either 4K or 8K of RAM! It was essentially a computer driving a small built in monochrome monitor which was capable of displaying 40 X 25 character graphics. The machine also included a built-in Datasette for data storage located on the front of the case, which left little room for the keyboard. The chiclet keyboard ended up being sort of 'compressed' on the front of the unit next to the datasette and was not easy to type with - especially if you had to work on the machine for a good few hours. The 2001 model was announced at the Winter Consumer Electronics Show in January of 1977. The first 100 units were shipped to customers in October of the same year. These units remained back-ordered for months, and to ease deliveries Commodore eventually cancelled the 4 KB version early in 1978 which turned out to be a very wise move. Although the machine was pretty successful, there were complaints about the tiny calculator style keyboard, which is hardly surprising considering how cramped it was. This desing fault was addressed in upgraded 'dash N' and 'dash B' versions of the 2001. The designers placed the cassette outside of the case and included a larger keyboard with a full stroke non-click motion to make the unit more user friendly. These versions of the machine were known as the 2001-N-8, 2001-N-16 or 2001-N-32 respectively. 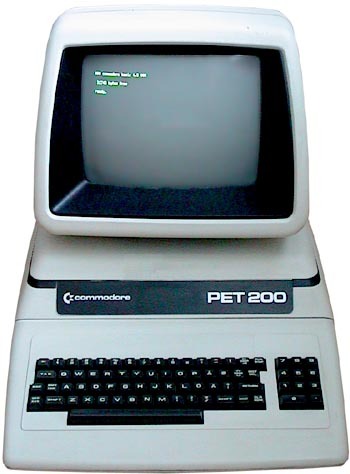 What Does A Commodore PET Look Like? The 'all in one' CBM PET in full retro glory! 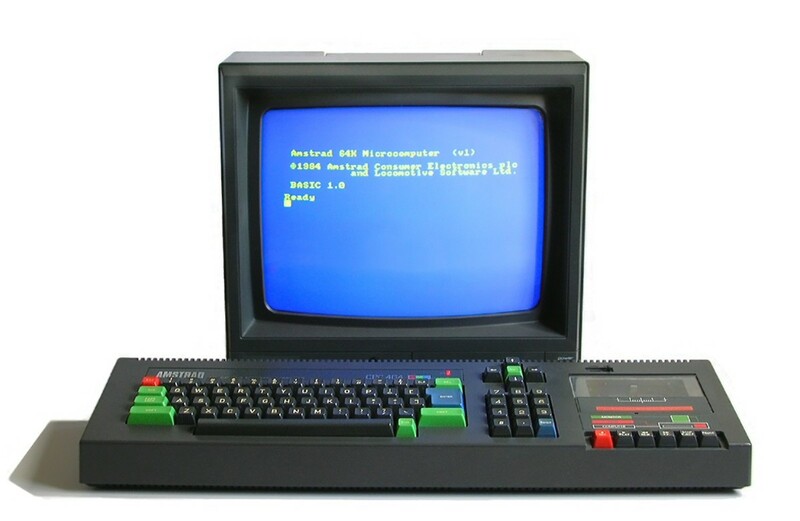 Sales of the newer versions of the machine were strong which prompted CBM (Commodore were still known as Commodore Business Machines at this point) to introduce the models into the European market. 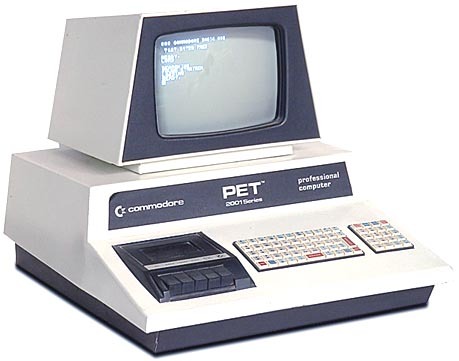 However there was already a machine named the 'PET' for sale in Europe from the huge Dutch company Philips, so Commodore could not market it under the 'Personal Electronic Transactor' moniker. 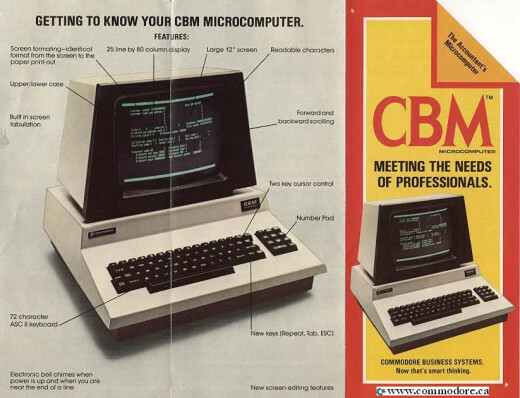 The resultant name change was the almost ominously titled CBM 3000 series ('CBM' standing for Commodore Business Machines), which included the 3008, 3016 and 3032 models. Like the 2001-N-8, the 3008 was quickly dropped in favour of the newer versions. Businesses made good use of the machine once it had a better keyboard and the tape drive had been made external. 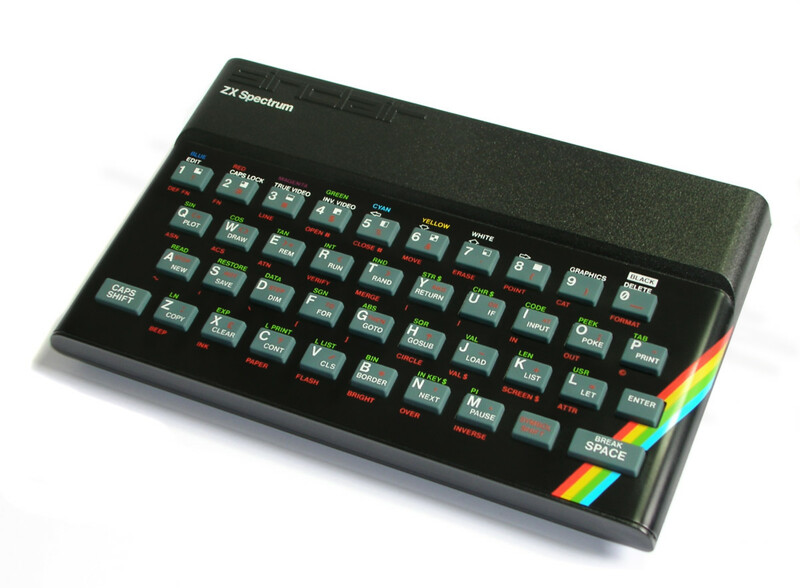 Later machines were also fitted with a different chip to expand the screen columns from 40 to 80 and were also expandable to a then huge 64KB of RAM. These later models could also have terminal software installed to allow them to be connected to a mainframe which again was ideal for many businesses. In the UK the machine was quite popular in schools until around 1982 to 1983 when the BBC Micro became the educational machine of choice. With the PET originally selling for around £700.00 it was unsurprising that schools, colleges and businesses were the main takers for this hardware! 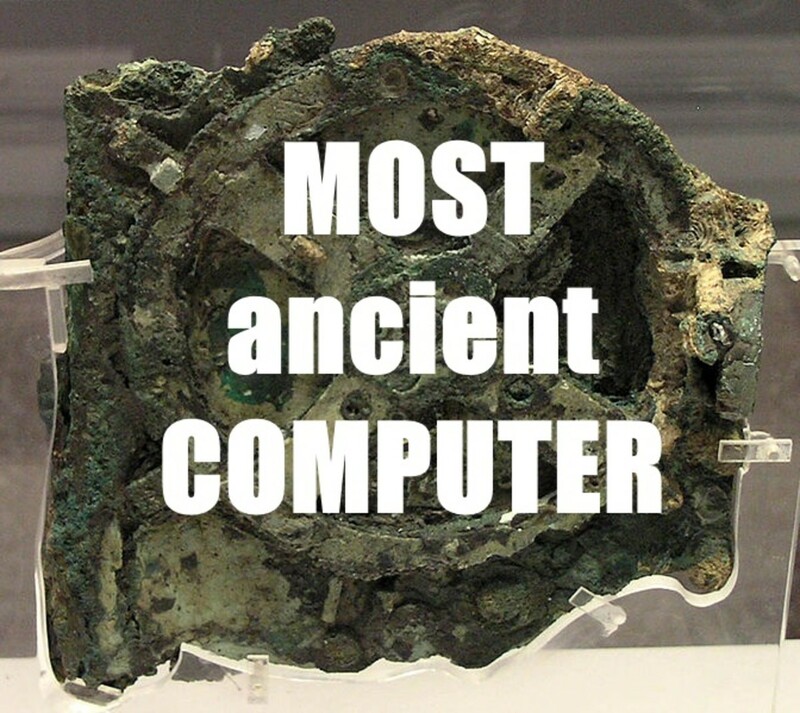 As time marched on, more and more people were bitten by the technology bug and desired a computer in their home which ultimately became the undoing of the PET. 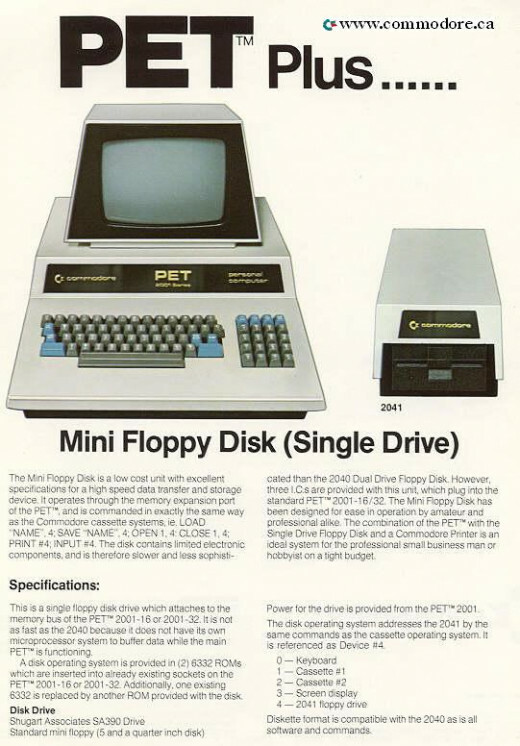 Machines soon became available that included bitmapped color graphics and sound such as the Apple II, which had been introduced a few months later than the PET. These are the sort of features paved the way for the development of arcade games and shoot em ups on home computers. As we hit 1979 Atari released their 400/800 home machines and then in 1981 Commodore unleashed the 'friendly computer', better known as the VIC 20 which was endorsed by captain Kirk himself, William Shatner. This new machine from Commodore would go on to be huge seller that really cemented their reputation as a major player in the home computer market. The mainstream business computer market of the late 1970s considered colours and graphics somewhat unimportant, but the home user was intruiged by a colourful display, animated graphics and dazzling sound effects. These newer machines that sprang up in the early 1980s were leaps ahead of the PET which ended up being superseded by the new glut of 8-bit machines as technology moved forwards and prices dropped. 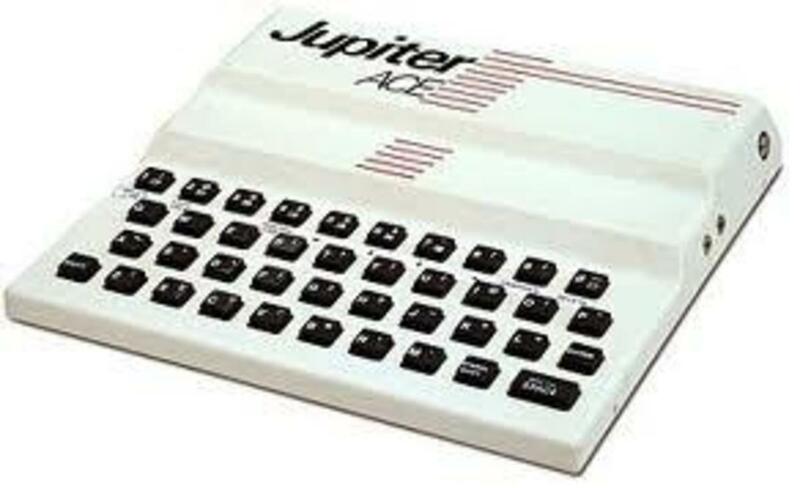 Due to the PET having no sound capability at all and the display being monochromatic it never became known as a games machine, it was business all the way for this baby. Having said that there were of course a few games created for the machine with versions of arcade classics such as Space Invaders and Pac Man available to play. Early 3D gaming was also explored with titles such as Labryinth - it's amazing too look back and see what was created on such limited hardware. Remember this machine was in no way designed to create or run computer games. Unfortunately the machine was superseded by the myriad of 8-bit machines that were released in the early 1980s with home users going for the likes of the ZX81, VIC 20, Commodore 64 and ZX Spectrum. The Commodore PET is worth a look for what it achieved in the business world and for also making us all familiar with the name 'Commodore'. Hello World, Pacman And Space Invaders running on the CBM PET! 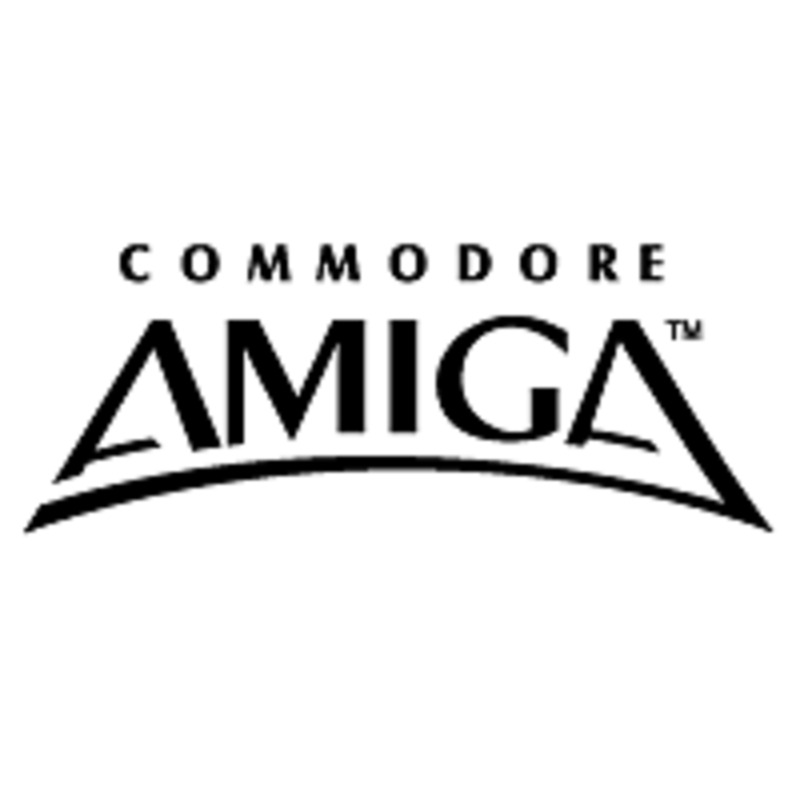 The PET eventually led to the Amiga and it's awesome games! How Many Of You Have Ever Used A CBM PET? Did you ever use one of these machines? Any Fans Of The Commodore PET?